Stay tuned for upcoming events for Adobe After Effects Workshop in near future. Adobe After Effects Workshop will take place from 10th March to 1st April 2018 at Launchbox in Lahore, Pakistan. 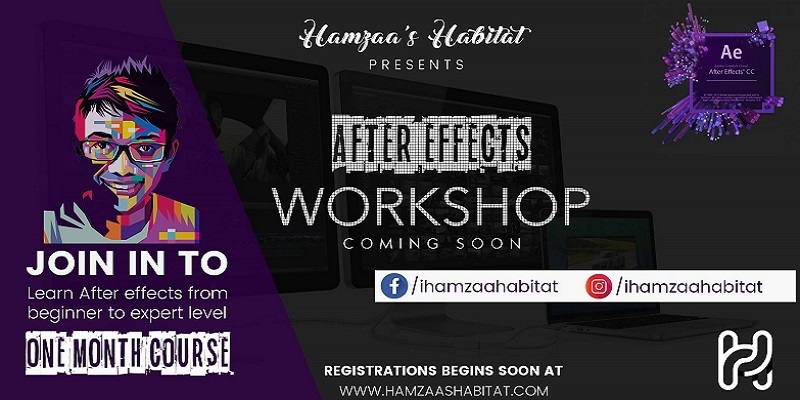 Adobe After Effects Beginner's Course is organized by Hamzaa's Habitat. This hands-on-experience Motion Graphics & Animation training will be conducted by Hamzaa Shergill. Ever wanted to do crazy things with motion graphics and live a life of a video animator? Here is the chance to learn squalling techniques of animation using and learning Adobe After Effects and Adobe Premiere Pro right from the scratch. This is a one month course with 8 classes, every Saturday and Sunday. You'll be taught every necessary tool / software. After the completion of the course you'll definitely be able to play with motion graphics. You will be well versed to create awesome animations and typographic videos. At the end of the course you'll be given a bunch of templates of After Effects, free of cost to practice your learning. Hamzaa's Habitat is a Media & News Company, working in fields of Photography, Videography, Cinematography, Video Editing, Animation, Motion Graphics, Content Creation, Blogging and Teaching/Training/Workshops of different Adobe Softwares. Terms & Conditions : *Once you get this ticket you cannot withdraw or refund it *Getting this ticket means you have deposited the payment into the bank account *After getting this ticket send the picture to us on our facebook page and we'll add you in the facebook and WhatsApp group *One person can get only 1 ticket with one email id *It's on first come first get policy since tickets are only limited to 25. Best Viewed at 1024 x 768 pixels and above. This Page loaded in 0.08977 seconds on Tue, Apr 23, 2019 (21:49).